The long-established and highly respected narrative bibliography The Year's Work in English Studies represents a rich resource for scholars in all fields of English and literary study. Each of the 75 existing volumes (appearing annually from 1919 to the present) offers a unique and comprehensive account of the best work in a particular field of study for a given year. Now Blackwell Publishers present special editions of these important documents, the English Association Critical Bibliographies. The value of the special editions lies in the re-formatting and collation of the vast amount of data currently available in the 75 annual volumes. The material has been collated into topic-based volumes dealing with a specific period, subject or major author as documented over a number of years. Where formerly all references to American Literature, would have to have been researched from a collection spanning three-quarters of a century, everything published in this area can now be accessed directly in the special edition boxed set, saving valuable time and research resources. The result is a reference series that provides specialists in a specific literary field with a tailor-made account of his or her area of study. The English Association Critical Bibliographies also make an important contribution to our cultural history. The volumes offer a unique insight into the way the study and teaching of literature over the century has been institutionalized, transformed and by whom. In the current climate of cultural dispute, scholars are given a chance in these volumes to address the question as to how and why literary study has evolved as it has. 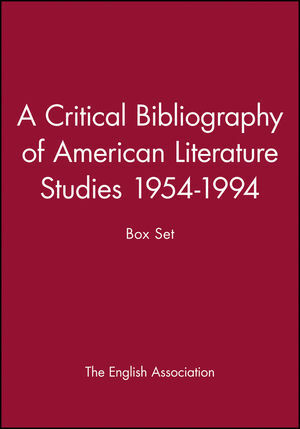 Bibliographical coverage of American Literature Studies began in 1954, with a general and then period by period survey (of fifteen double-column pages) by Marcus Cunliffe. He begins, appropriately, with a review of the analytical index to the journal American Literature, published by Duke University and the American Literature Group of the Modern Language Association, and closes with reviews of studies in the modern American novel as written by Hemingway and by Faulkner. The series continues down to 1994, concluding with more than a 130 pages of reviews by two teams of scholars dealing with the nineteenth- (chronologically: to 1830; 1830-65; 1865-1900) and twentieth-centuries (on Poetry, Fiction 1900-45, Fiction Since 1945, and Drama). List of Journals, Series and Reference Works. A Critical Bibliography of American Literature Studies. * A superb reference series tailor-made for specific areas of study. * Derived from a respected and long-established Association at the heart of English Studies. * Provides an important historical account of the development of each area of study throughout the latter half of this century. * Documents the transformation of the study and teaching of literature as part of our cultural history.